Sorry with the late post, but you know the Fab Crew had to give their voice on the best dressed at the BET Awards last night. I have to admit, the guys weren’t giving us what we needed, but the ladies were definitely representing. 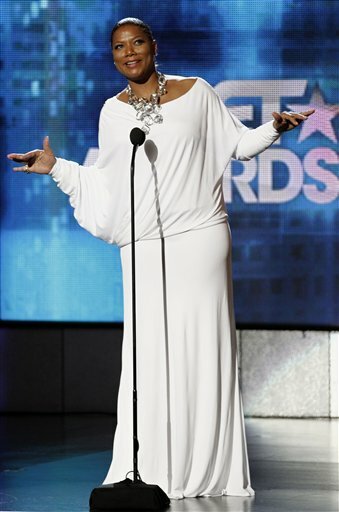 Of course, we gotta start with the host, Queen Latifah. When she decided she wanted to put on a gowm she looked AH-MAZ-ING. The white off-the-shoulder gown was my favorite, but this black number wasn’t too shabby either. Brandy and Ray-J looked good too. I’m loving Brandy’s new hair, and her shoes were the truth! And Ray-J knows how to wear a suit. The Fab Crew is pro-Keri Hilson. She has a couple of slip-up’s here and there, but she was right on point for the award show. Many bloggers tried to say she was biting Rhianna’s style, but Keri is just too beautiful to even care. The two ladies have two separate swags when it come to clothes. Taraji’s people never go wrong with her look. I was loving her hair his year. Now, I hated Jada’s onsie-sailor suit, but I cannot doubt the appeal and charisma of this family. I want my kids to have this much style at the ages of 9 and 12! Ok, lastly, honorable mention goes to Nia Long and Larenz Tate taking us back to the Love Jones days! Loved it! Plus Nia looked too good rocking that Gucci dress and the classic Nia shrt cut. Can we get a Love Jone 2 please? Thanks!